Sea-Doo Pro Sea Scooter | Nerd Much? Sea-Doo is mostly known for their snowmobiles here in Upstate New York (that’s where Nerd Much’s headquarters are, FYI), but we’ve just come across this incredibly cool Sea-Doo Pro Sea Scooter that needs to be shared with our readers. 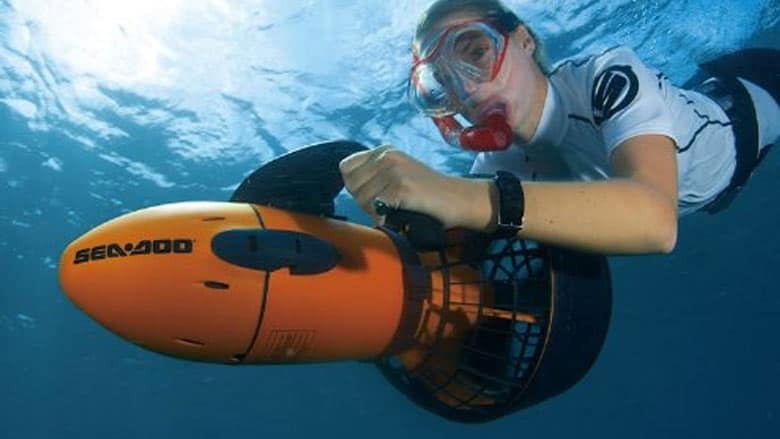 With this underwater scooter, you’ll be transported about the ocean at 2 MPH as you’re snorkeling or scuba diving. It can be used for dives as deep as 65 feet, and it’ll help you through choppy currents. It weights just 13 pounds, and is compact and easy to carry, and has an hour of battery life per charge. Its buoyancy is adjustable, and it has an ergonomically designed shell that allows it to be easily gripped and held onto. Of course, it doesn’t have to be used in the ocean — you can use it at the lake if you’re feeling lazy. Best of all, it looks vaguely like a torpedo or nuke. So, there’s that. It won’t explode though, don’t worry. For more cool stuff to buy, stay tuned to Nerd Much.